No matter how big or small the job may be, our experts have years of experience in cleaning, repairing, and replacing sewers and drains. We offer free estimates on all of our services and can typically honor one of our amazing discounts! RapidPlumbing technician performing plumbing services. We offer a full service suite of plumbing and pipe repairs. 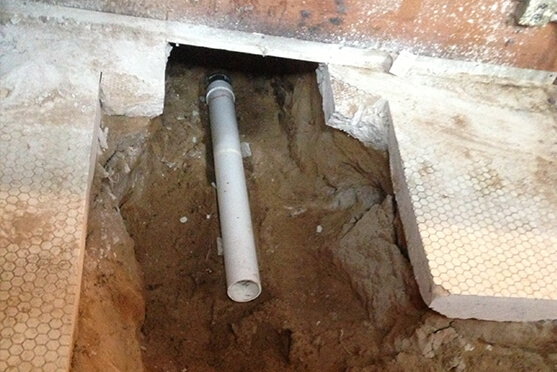 Repiping allows us to replace your broken pipes without digging up your yard or you slab. Got a problem in the bathroom, let us make sure your toilet does the job without an issue. Leaking faucets are wasteful and annoying, let our pros get it right the first time. Don't wait until its too late, check your pipes integrity with us. Garbage disposal backing up? Let us diagnose it and clear it out. Water heater on the fritz, feeling the chill in your shower. We're here to help. Got hard water, we can install a system to ensure that the discomfort and limescale are things of the past. Broken sewer pipe, call us before you dig up your yard. We can replace it using our trenchless technology. We believe in protecting the environment and are happy to offer home inspections that comply with the highest standards. Don't wait until you have a costly problem, maintain your pipes with our help.